My Mom used to raise chickens on our farm when I was growing up. To be honest with you, sometimes those crabby hens would scare the heck out of me, but I sure developed a love of the eggs they provided. Farm fresh eggs– there is nothing better. One of my favorite ways to eat them is pickled. 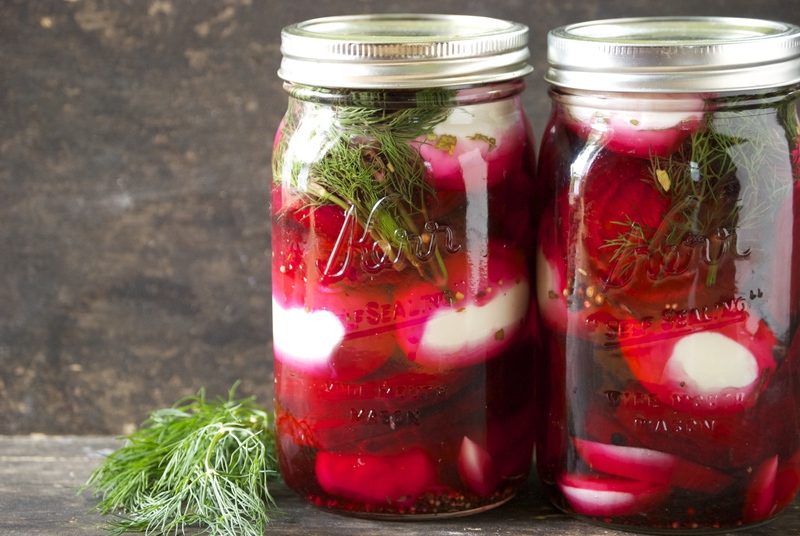 I previously shared a favorite recipe of mine for pickled eggs. And though I absolutely love that version– the spicy heat is just too much for my kids. 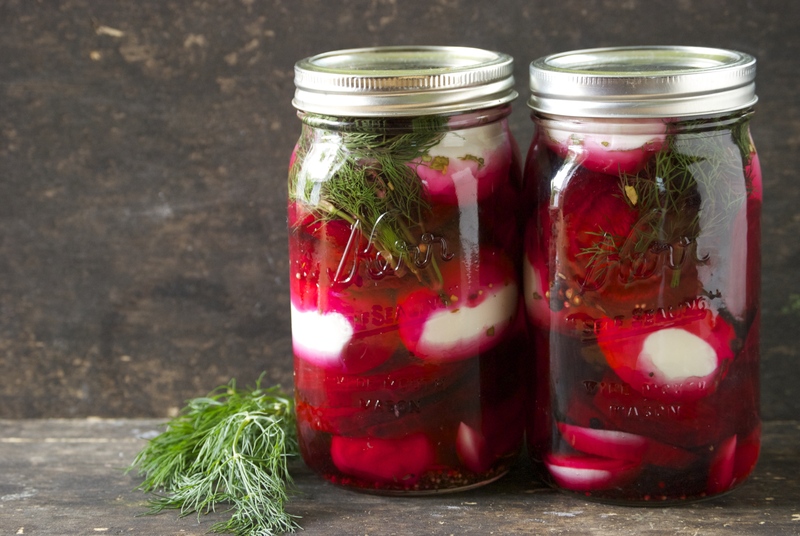 Today’s version with beets and dill has absolutely no heat– but the flavor is unreal. I was worried that my husband wouldn’t quite go for it. I love beets, but I thought it might be too much for him to embrace. I was completely wrong. Even without the heat, he was loving them. 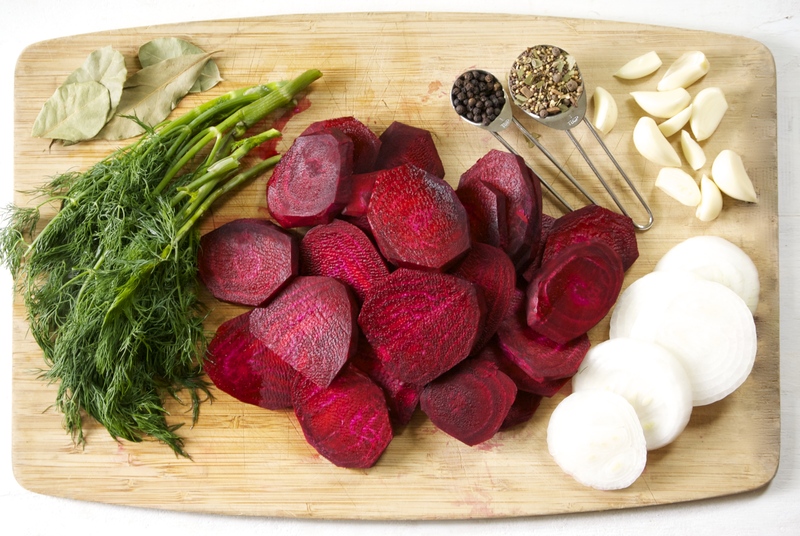 Beets and dill are an excellent combination. 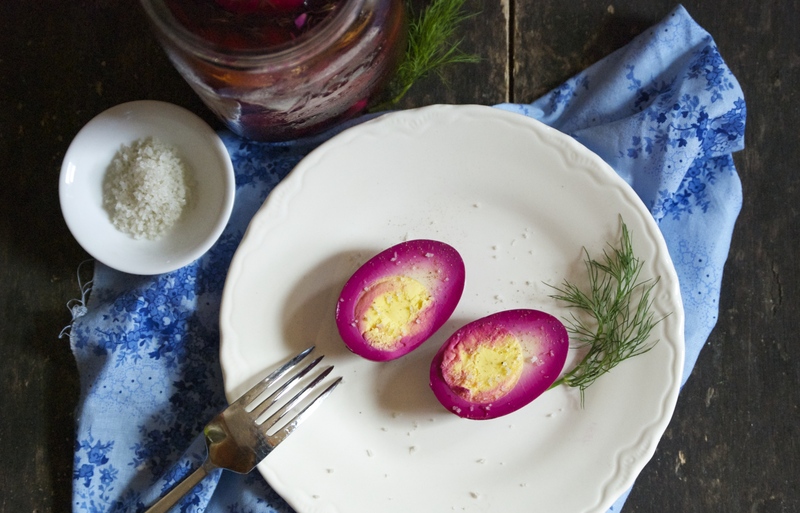 Here, the eggs take on a beautiful deep purple hue and are laced with a dill flavor. The beets and onions become perfectly pickled, as well. Chopped up they work wonderfully atop egg-salad sandwiches, paired with pork, or just eaten as a snack. The beets remain somewhat crunchy, which I love. The eggs pickle rather quickly–and the lovely purple hue is present after just a day or so. The longer the eggs sit in the vinegar, the less white from the eggs will be present. Eventually the entire egg will be purple. Which tastes amazing, but if dramatic effects are what you are after– it’s best to eat them within 5 days, or so. Eggs are a perfect, portable protein to snack on– we pack them a lot for school lunches and for summer outings. Make sure to buy good quality eggs, preferably from a farmers market or co-op. You’ll end up worrying a lot less when you feed them to your family. Give this version a try–I hope you enjoy it as much as I do! Note: To properly boil eggs– add eggs to a large sauce pan filled with water. Bring to a boil. Boil for one minute, cover with lid, and remove from heat. Let stand for 10 minutes. Then immediately drain the eggs and place them in a bowl of cold water filled with ice. This will stop the cooking process and yield a perfectly hard-boiled egg. Divide all the ingredients between the two quart jars. Layer the eggs, beets, and onions. Fill each jar with enough vinegar to cover all of the ingredients. Put lids on the jars and give a gentle shake to mix the ingredients. Place in the refrigerator. Eggs will be ready in about 2 days. The flavor and color will deepen the longer they sit. After about 2 weeks, their texture may start to change and be less firm, so it’s best to eat them before that happens. Enjoy! Have a great day and thanks for stopping by Relishing It!